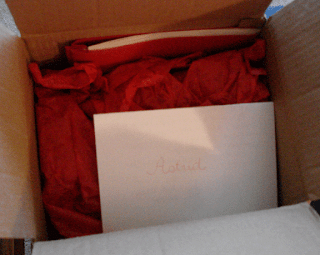 Astrid Cloverleaf: a knitting persona blog: My package arrived! Owl post arrived this afternoon all the way from Tennessee. 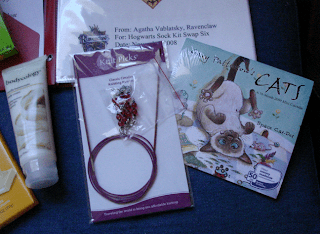 Agatha Vablatsky sent me a wonderful package and I'm definitely nominating her for Best Kit! 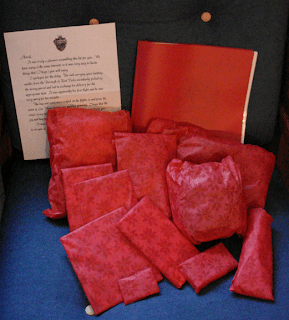 first the box all nice and packaged with a note on top. all my goodies laid out! 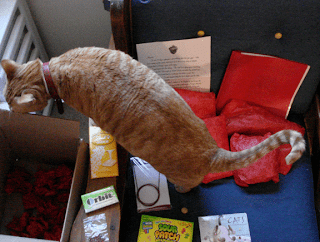 Phoenix decided to take a sniff around to see what I was getting. the best part! 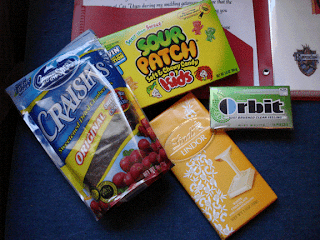 haha... my favorite snacks cuz Agatha is AWEsome! Craisins, Sour Patch kids, Mint mojito Orbit gum and white chocolate Lindor numminess. a close-up of the stitch markers - did you make these, Agatha?? the wonderful yarn goodies: the bag and scarf were crafted while Agatha was on the plane to and from her honeymoon... talk about good luck! 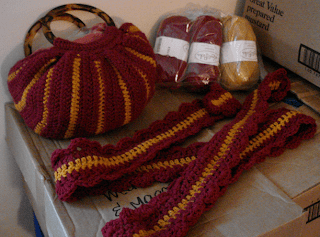 and of course KP Essentials yarn in Gryffindor colors. 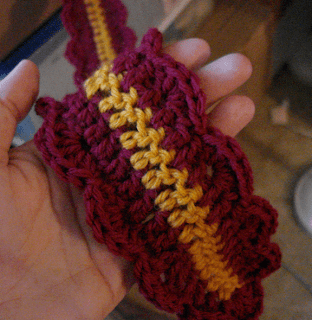 a close up of the scarf.. i want to learn to crochet now! thank you so much for everything Agatha! i love love love it! the bag is the perfect size for small knitting projects to take to work with me. and now that it's freezing here in NC, i'll be making very good use of the scarf. soooooo cool. that purse is rad! Oh wow! That kit looks amazing!!! the FBB is awesome... shall store it in memory queue. Is it lined? is FBB the bag? 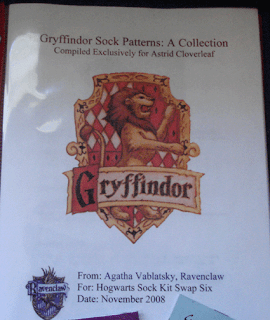 it's not lined nor felted... but it IS awesome! Yup its the FBB :) My sewing skills aren't so hot so I didn't attempt lining it. 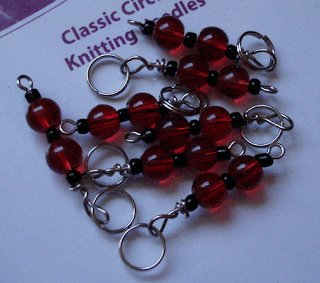 And the stitch markers were made by moi!